Barcelo Bavaro Palace resort is a spectacular 600 room all inclusive resort, just 12.4 miles from Punta Cana international airport, and 117.8 miles from Las Americas international airport. We are located on Bavaro Beach, with fine white sands stretching for 7.44 miles. We are an allinclusive resort, offering outstanding accommodations, round the clock activities, and superb meals and beverages. 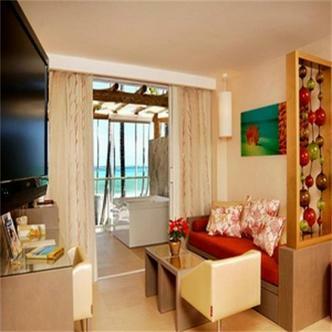 The Barcelo Bavaro Palace Hotel is the most luxurious. Our spacious swimming pools, are the perfect complement to the day at the beach or of sport. At night, shop at our luxury boutiques to a background of soothing piano music, watchone of our shows or go to the 3 discotheques in the complex.